Nathan was a brother, a wonderful best friend, and a great classmate. Then one day, Nathan was gone. If Nathan Were Here tells a story of what it is like for a community and family to lose a loved one. This book shows us the true need and meaning for friendship. 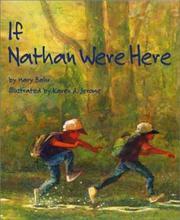 Bahr, Mary, “If nathan were here,” Children's Picture Book Database at Miami University, accessed April 26, 2019, https://dlp.lib.miamioh.edu/picturebook/items/show/13209.